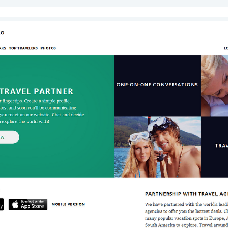 Bonatea is a landing page for a dating site in the travel niche, with the focus on looking for travel companions. It works both on desktops and mobile devices. The page displays stock photos that you can replace with your own imagery. There is a place for the introduction texts and download app icons. Bonatea is available in English and Russian. You can create new language versions of the page by copying the language files (.json) and editing them. [site_path] stands for direct path to the landing page files on the server, relative to the root directory of the site, as in /bonatea/. 7. Save the changes. Now you should be able to open the new landing page by following the link http://yourdomain.com/bonatea.